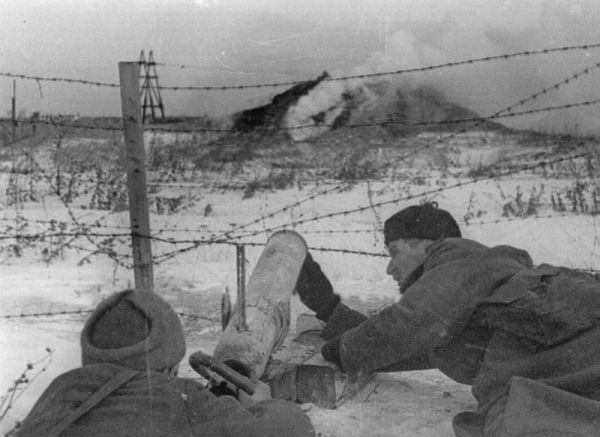 "As German troops invaded the Soviet Union in June 1941, the Red Army scrambled to arm itself with anti-tank weapons. One system the Soviets hurriedly developed was the Ampulomet, a mortar that launched a glass projectile filled with an incendiary mix. The Ampulomet is certainly one of World War II's weirdest anti-tank weapons. It was similar to the British Blacker Bombard and Northover Projector…." I know it's a rarity, but I'd love to have one of these in 15mm. Been interested in them since I first came across them in the late 90's computer game, Combat Mission. Mol-P projector in ASL, hence in Combat Mission. Fun until they blow up in your location! An interesting piece of kit. I've read up a bit, and participated in a few discussions on other fora about this. Somewhat disappointed in the article. You'd think they could have gotten a picture of Soviet troops using it, not just Germans and Finns. It's not too hard to kit-bash one up if you are at a different scale or use different vendors. Just put a shorted 120mm mortar barrel on a Russian wheeled HMG mount, (whether you clip off a Degtyarev/Maxim M1910 or an SG43 hardly makes a difference), or just leave it with a for-shortened bipod by using the center/front section of the mortar (clipping off the base). At least at 6mm it's a pretty easy winner. My preferred ruleset (ODGW's Mein Panzer) doesn't have this particular piece of kit well represented. I've cobbled my own house rules for it by combining the mobility of a Russian HMG team, the accuracy of a panzerfaust, and the target impact of a molotov cocktail. I was thinking of making stats for it for a computer game but found an article pointing to it being ineffective. 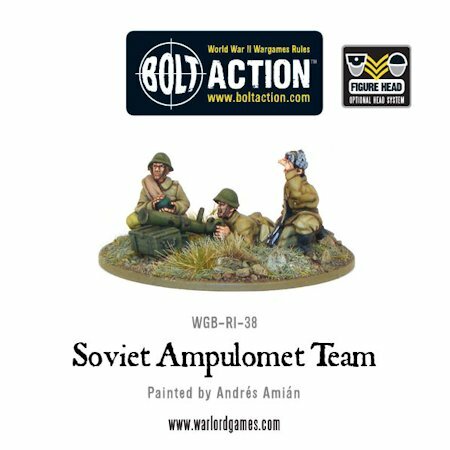 Here is a Russian experience with Ampulomet. Thanks for the link, Mobius. Guess my house rules need an additional "On die role of 1, device misfires and scores automatic hit on firing crew", or some such. Liked the bit about Lelyushenko having all the Ampulomets issued to 30th Army run over by a tank to ensure no one would try to use them. Ads a bit of "color" to my understanding of the history of this weapon. From my understanding it was a common weapon during Barbarossa, being considered a "standard" rifle battalion AT asset. Depends on what period you mean by "Barbarossa". Essentially, to my knowledge the weapon did not exist even as a design at the time of the German invasion. Rather, it was hurriedly designed and put into production in late 1941, and would have mainly seen action in 1942 (after which it was withdrawn from use). Organisationally, the tables given in Zaluga's Red Army Handbook show it only as an armament for a regimental anti-tank company, being armed with around 6 of the weapons (with 3 crew each). Standard rifle battalion anti-tank asset in summer 1941 would have been 45 mm anti-tank gun, supplemented with anti-tank rifles in 1942 as they became available. Mark 1 as always very precise. I will have to follow his advice and scratchbuild one myself.